Last Sunday my brother Roger Lee and I went out for breakfast. For no real reason, we chose to leave the city and go find a diner or local cafe in a small town. 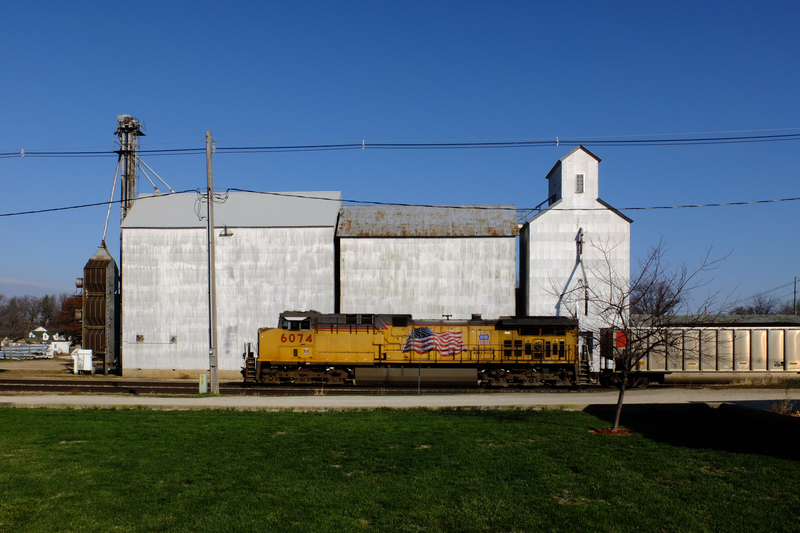 Iowa is teeming with small towns. We found ourselves at CayAnne’s in Woodward (population 1024), and breakfasted on biscuits and a tasty but rather odd-looking spicy sausage gravy. After breakfast we sort of noodled around the county, sliding in and out of various small towns. Like the town of Moingona (population unknown, but it’s really small), where we saw the original town school. It’s not in use (at least I don’t think it’s in use), but it was nice that the town cared enough about the old building to preserve it. 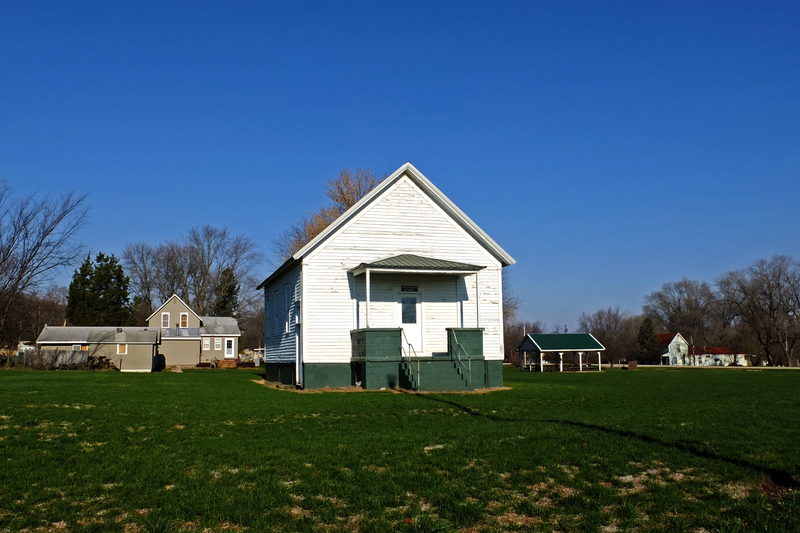 The school probably constitutes about 5% of all the town’s structures (excluding sheds). Like I said, the town is really small. Moingona is named for the native American tribe that inhabited the area before white folks arrived and casually took their land and kept their name. The town was home to Kate Shelley — the first woman in the U.S. to have a bridge named after her. On a stormy night (okay, it was a dark and stormy night) in July of 1881 a railroad bridge was partially washed out by a flash flood. A pusher locomotive that had been sent out to inspect the track conditions failed to notice the mostly-missing bridge. Our Kate, hearing the crash, rescued two of the engine’s crew (the other two died). Knowing that a passenger train was scheduled to pass over the bridge soon, Kate (relying on the illumination of the storm’s lightning) crawled across the remaining span of the damaged bridge, then ran a mile or so to alert the nearest depot manager of the problem. The passenger train, with 200 aboard, was stopped in time. A grateful Chicago & NorthWestern Railroad rewarded her with US$100, a half barrel of flour, half a load of coal and a life-time pass. Later they named a nearby bridge after her. 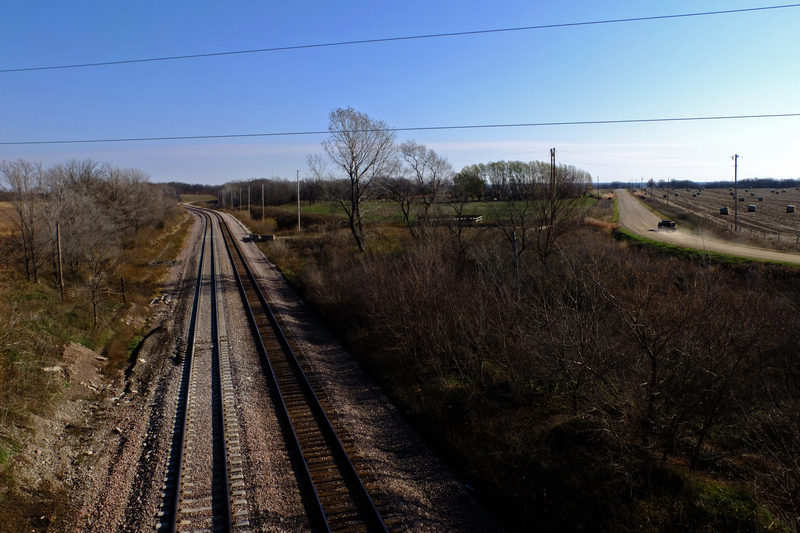 After we left Moingona, we discovered the railroad tracks were still in use. We began to sort of leisurely follow them. I can’t say it was an intentional decision at first, but the tracks seemed to parallel the general direction we were heading. After a while, we began to feel some sort of connection with them. I believe it was outside of Ogden (population 2041) we came across some sort of slag heap, or possibly the tailings of a mining operation (both coal and iron were mined locally in the late 19th century). The truth is, I don’t know what the hell it is. It’s a massive pile of something. 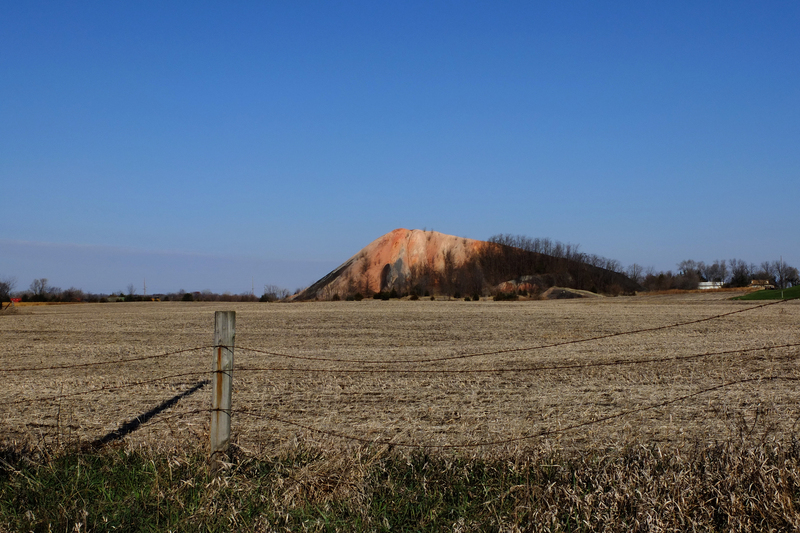 It looks vaguely like a smallish, Midwestern version of Ayers Rock in Australia. You can get a sense of the scale of the pile by noting the house and large garage on the right side of the frame. Aside from the dwarf alpaca, this pile of something may have been the oddest thing we saw all day. 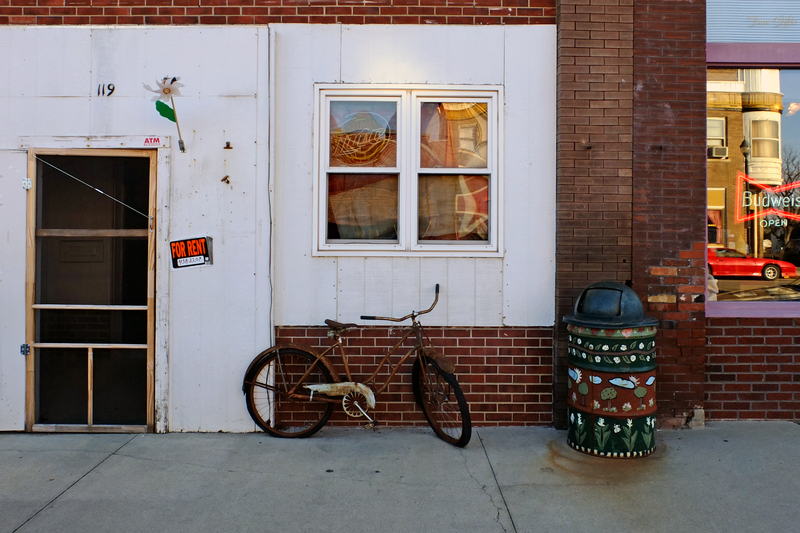 We eventually found ourselves in the town of Boone (population 12,661). Boone was originally a coal-mining town. A pair of thick coal veins were discovered near the banks of Honey Creek, which attracted local blacksmiths (who needed the coal for their forges). 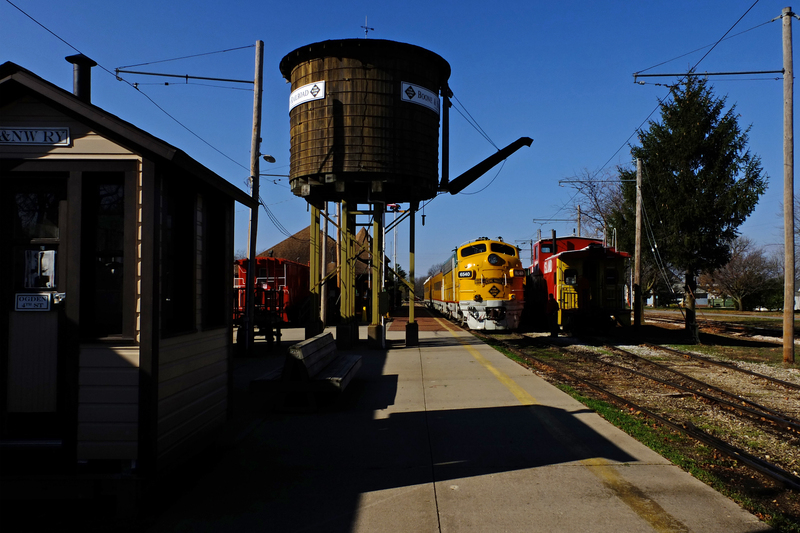 It became incorporated as a town in 1866, the year the C&NW Railroad laid track through the area. The Lincoln Highway passes through Boone. That’s the first transcontinental road built for the automobile. The Lincoln Highway begins at the intersection of 42nd and Broadway in Manhattan and ends at 100 34th Avenue in San Francisco; that’s the address of Lincoln Park and the California Palace of the Legion of Honor. When I win the Lotto, I think I’ll spend a few months idling along the length of the Lincoln Highway. Boone, to my surprise, also turns out to be the home of the Pufferbilly Days Festival. I’d never heard of Pufferbilly Days. In fact, I’d never heard of a Pufferbilly, It turns out that Pufferbilly is another term for a railroad steam engine, and the festival appears to be a celebration of All Things Railroadish. The Boone Scenic Valley Railroad operates a number of old railroad engines, and periodically takes passengers on short jaunts around the area (including, apparently, the Kate Shelley Memorial High Bridge, which I’m assured is the longest, highest, double-track railroad bridge in the country — who knew, right?). 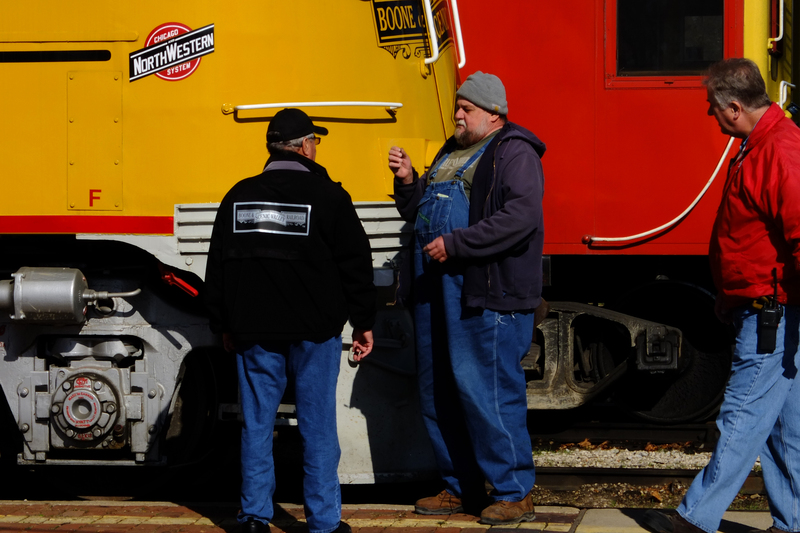 While we were nosing around the depot area, a couple engineers and assorted other folk were warming up Engine 6540. Unfortunately, by that time Roger Lee and I had already pissed away the entire morning and were running late, so we couldn’t stay to see if they were planning to take the train anywhere. All in all, it was a strangely entertaining morning. Unfortunately, I failed to photograph the herd of dwarf alpaca (which, upon closer examination, turned out to be a single adult alpaca standing in a herd of goats) or the peculiar reddish-orange sausage gravy we had for breakfast (the gravy was similar in color to parts of the large Pile of Something which, now that I consider it, is a wee bit alarming). Still, I still managed to shoot just under fifty frames during the morning. For me, that’s a lot of photos. Roger Lee and I plan (well, as much as we plan anything) to do this periodically over the next few months. We’ll take off on a Sunday morning, find a small town for breakfast, and then wander around pointlessly until we’re late, after which we’ll hurry back to the city. It may not be a very tight plan, but it’ll do. This entry was posted in where i went, you learn something new by greg. Bookmark the permalink. I was hoping for a photo of the dwarf alpaca. Please promise me that next time you’ll get a shot of the biscuits and gravy. I second the dwarf alpaca photo. A few years ago (more than that, now that I think of it), Jeff and I traveled Route 30 in PA for my birthday. I’d love to see the whole damn road across America; you have to at least try to take it across Iowa.